Drove from Macclesfield to Buxton on the way to Alstonefield for a foodie feast. In the village pub has an excellent range of food including the amazing pudding pictured below. 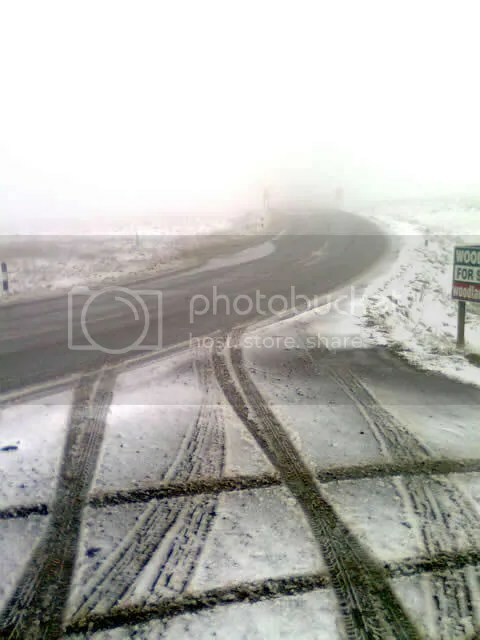 That snow shot was taken in a layby in Deryshire. I pulled the car into a stopping place and I got out with my camera-phone. Just as I was turning the snow yellow- a couple of heavily wrapped cyclists rode by on thin tire, racing bikes. They did look rather nervous at the top of what must be a big big climb, and not because they’d spotted me. The fog was too thick for that. Here is food that I’d journeyed through snow for. 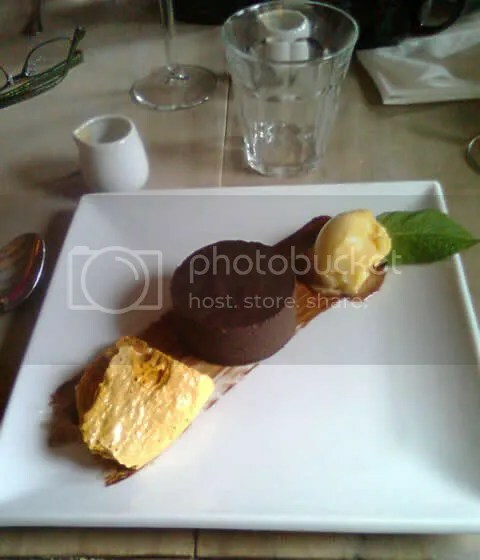 Look at the photo from left to right- there is honeycomb, chocolate mousse and lemon sorbet. All of that was presented on a skid-mark of chocolate sauce on the square plate. The most spectacular part was found inside the mousse. The brown cylinder of rich chocolate was rather rich but once cut inside- it bled from the wound a yellow-orange thick sauce oozed. That alien blood was rich and tangy and countered the rich sticky body of the pud. This entry was posted in Food and drink, Travel and tagged Alstonefield, Buxton, Chocolate, Chocolate syrup, Cook, Macclesfield, Mousse. Bookmark the permalink.